Save 20% on this promotional pack! A fantastic offer for all businesses, especially SMEs. This pack brings together two essential publications to ensure safety in the workplace. The newly updated edition of the accident book is a vital document for employers and employees, who are required by law to record and report details of specified work-related injuries and incidents. The book contains 50 perforated accident record forms and is designed to support users in being GDPR compliant. The Law poster needs no introduction - All employers have a legal duty under the Health and Safety Information for Employees Regulations (HSIER) to display the poster in a prominent position in each workplace or provide workers with a copy of the equivalent leaflet. 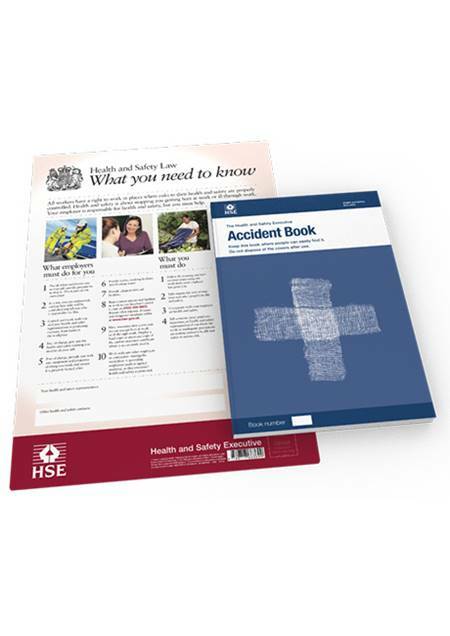 The Accident Book is an essential document for employers and employees, who are required by law to record and report details of specified work-related injuries and incidents. It enables businesses to comply with legal requirements under social security and health and safety legislation, including Reporting of Injuries, Diseases and Dangerous Occurrences Regulations (RIDDOR) requirements. Complies with current legislation, including RIDDOR, GDPR and HSE standards. The Health & Safety Executive (HSE) has published a simplified version of the Health and Safety Law Poster. All employers have a legal duty under the Health and Safety Information for Employees Regulations (HSIER) to display the poster in a prominent position in each workplace or provide workers with a copy of the equivalent leaflet.